Tooth loss can really take away from your quality of life -- but it does not have to. Dental implants in Florham Park are a wonderful way to replace any number of missing teeth in the upper or lower jaw. As a comprehensive option which takes the place of the missing tooth’s root as well as the visible crown, a dental implant provides unsurpassed stability for a healthy, complete smile that can stay sturdy for a lifetime to come. But how do they work? Keep reading to find out about the magic behind implant dentistry. Dental implants work so well thanks to a process called “osseointegration.” This is what we call the fusion of the dental implant post with the jawbone, which occurs over a period of 4 to 6 months. Osseointegration is possible because the implants are made of titanium, which promotes the growth of bone tissue to help the implant posts become one with the jaw. 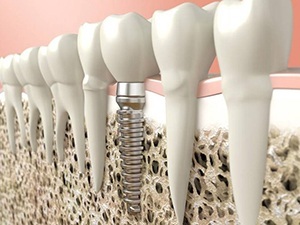 Once osseointegration has occurred in a traditional implant procedure, the implant posts will be exposed again and a connecting abutment will be placed on top. 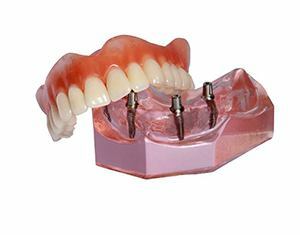 One more brief healing period is required before the crown, bridge, or denture can be permanently affixed to the connecting abutment. With proper care, dental implants can be expected to last the wearer’s lifetime. There are special dental implant procedures which work a bit differently from the traditional method described above. For example, with one-stage dental implants, the permanent tooth replacement can be placed on the same day. The implant posts are placed strategically within the jaw and then immediately restored with a fully-functioning prosthetic. This method, called All-on-4 or Teeth In a Day, is possible because the implant posts are longer and do not require a connecting abutment. One-stage dental implants are typically a suitable option for patients who have experienced significant or complete tooth loss in the upper or lower jaw. 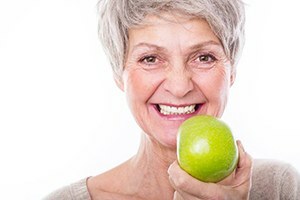 No matter which option is best for you, dental implants offer benefits that other options in tooth replacement simply don’t -- like a natural-looking, long-lasting smile that promotes better oral and overall health! Here we have provided a brief description of how dental implants work, but to learn more, please do not hesitate to get in touch with your periodontist in Florham Park, Dr. James Rynar! Contact us to schedule an appointment to discuss implant dentistry for your smile.